Located in the beautiful area of The Dordogne, Le Grand Dague is a luxury camping site that is the ideal destination for families. If you are looking for an area that is filled with stunning countryside and surrounded by national parks, with great weather and friendly locals, then Le Grand Dague LUX-camp may be for you. This site offers luxurious and comfortable mobile homes that serve as great accommodation for your holiday. 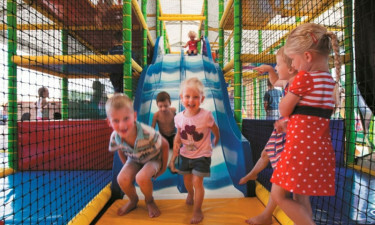 The site has wonderful facilities and is guaranteed to keep kids entertained! Why should I camp at Le Grand Dague? 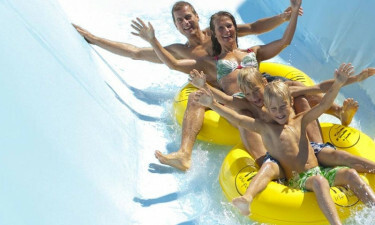 Le Grand Dague luxury camping site has an outstanding pool complex, with a wide range of different slides and other extras. It has 2 heated pools as well as 3 waterslides. It even has a mini lagoon for babies and toddlers. The complex has recently been extended to add an extra hydro massage pool, as well as beaches and a small island to add to the exotic getaway feel. There's also a crazy river, a pool pirate ship and a water playground. The various pools suit babies, children and adults, so there is something for everyone. 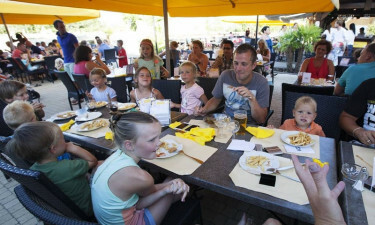 Le Grand Dague is renowned for being family friendly, and the friendly staff there know that many parents are hoping to relax on their holiday. That's why the site has a camping kids program, where the kids are entertained all day, with sports, competitions, discos, adventures and crafts. For older children and teenagers, there are various sporting activities, such as volleyball, Frisbee and table tennis. There are also family activities, such as mountain biking, trampolining and canoeing, as well as couples activities such as yoga, Pilates and even bingo! The park has been designed to ensure that holidaymakers can relax and enjoy their camping holiday as much as possible. There are amenities such as washing machines and Wi-Fi, along with bicycle hire and extended sanitary facilities. There's even a TV room, and important events are broadcast here, so that you never have to miss an important game! On site, there is a restaurant, pizzeria and snack bar. These areas serve a variety of food throughout the evening, which is ideal if you are looking to take a break from cooking during your holiday. Having delicious food on hand is ideal for a luxury camping experience. They serve traditional, hearty food and cater to all tastes (including fussy kids!). There is also a bar and terrace. There is a well-stocked grocery shop on site that is ideal for campers who wish to self-cater. The shop sells all the basics, such as bread, fresh fruit and vegetables. You can also stock up on toiletries and other essentials.